Self-awareness is one of the key components of emotional intelligence (EI). Daniel Goleman, the guru of emotional intelligence, identified self-awareness as being made up of emotional awareness, accurate self-assessment, and self-confidence. In other words, it is all about knowing your emotions, your personal strengths and weaknesses, and having a strong sense of your own worth. People who lack self-awareness find living a truly happy and productive life difficult. This can be difficult to overcome, as many societies and cultures encourage us to ignore our feelings and emotions – ‘Keep Calm and Carry On’. Examples of this include people who stay in jobs that they find unfulfilling or make them unhappy, or in relationships in which they are not comfortable. Be guided in how they feel by their personal values. Being aware of your own emotions, and how they affect your behaviour, is crucial to effective interaction with others. But it can also be crucial to your personal health and well-being. Some people find ways to mask their emotions rather than listening to them. Addiction to certain behaviours is often linked to emotional masking. These include excessive drinking and/or eating, over-working, computer games, gambling, exercise and any other activities that effectively distract the mind. People can find self-analysis of their emotions difficult, especially if they have suppressed them for a long time. It may be hard for people to accurately recognise their emotions and even more difficult to understand why they are feeling them. However, self-analysis is a vital skill to learn and develop for good emotional intelligence. A good starting point is to be aware of your values, which can also be thought of as your personal ‘moral compass’. For more about this, see our page on Developing your Moral Compass. These values have an emotional value to us, which therefore means that many emotional responses come from some action or event that touches on those values. If you are aware of your values, you can quickly see why you may have had a particularly emotional reaction to an event or person. Most importantly, you can then take action to address the issue, with a better understanding of the problem. Understanding your own and others’ emotions also requires a good understanding of your personal strengths, weaknesses, inner resources and, perhaps most importantly, your limits. It can be particularly hard to admit to weaknesses and limits, especially if you are in a competitive and fast-moving work environment, but it is crucial for emotional intelligence and your own well-being. People who are good at self-assessment generally not only have a good understanding of their strengths and weaknesses, they show a good sense of humour about themselves and their limitations. They are usually very reflective, learning from experience, and also open to feedback. For more about learning from experience and from feedback, take a look at our pages on Reflective Practice and Giving and Receiving Feedback. It can be very hard to admit to weaknesses, and many people may well be in a state of denial that they have any. Especially for those in senior positions, it can also be hard to get genuine, constructive feedback. This results in ‘blind spots’, problem areas which are completely invisible to the person concerned. Relentless hard work, working long hours, and being at risk of burnout as a result. These blind spots can make people very resistant to feedback, which makes it even harder to overcome the problem. The solution? Get into a habit of seeking regular and honest feedback from those around you – and then act on it. For help with making your own self-assessment of your strengths and weaknesses, why not try our Interpersonal Skills Self-Assessment? The final area of self-awareness is self-confidence, having a strong sense of your own self-worth, and not relying on others for your valuation of yourself. Generally able to present themselves well, and are often described as charismatic. For more about this, see our page on What is Charisma? and Becoming Charismatic. Prepared to voice unpopular opinions, and not always ‘go with the flow’. For more about this, see our page on Assertiveness. You may also be interested in our page on Courage, an essential part of being prepared to stand out from the crowd. Generally decisive, being able to make good decisions grounded in their own values. See our page on Effective Decision-Making for more. Self-confidence is absolutely vital for job performance. Without the ability to ‘tell it like it is’ when necessary, and to stand up for unpopular positions, it is very hard to achieve anything, especially during tough times. For more about developing your self-confidence, see our pages on Building Confidence and Improving Self-Esteem. Self-awareness is a crucial part of emotional intelligence. 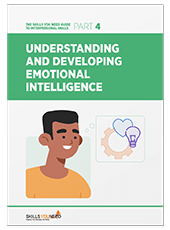 It is no accident that Daniel Goleman, the author of the book Emotional Intelligence, identified it as the first of the five competences that make up emotional intelligence. Without awareness and understanding of ourselves, and a sense of self rooted in our own values, it is hard, if not impossible, to be aware of and respond to the emotions of others.